Social media: a potentially exciting new way for businesses and organisations to have conversations with their stakeholders; a way of developing a campaign or a brand with a personal touch, or potentially a way to really stick their foot in it and magnify criticism to epic levels. I must admit, it’s a quite horrible shock advert in the usual Greenpeace style – Nestlé’s response was to get the video taken down from YouTube citing infringement of their trademarked logo. Almost since the beginning of YouTube what usually happens when a video is taken offline, a copy will be almost immediately uploaded again; and Greenpeace of course used this response to generate support for their campaign, and even made the original available for supporters to upload using their own accounts. The effect was immediate with tweets and facebook updates being bound around mentioning Nestlé’s censorship tactics – a suitably rebellious message which is popular for users of social media to repeat and pass on. This is a classic example of the ‘Streisand effect ‘ in which an attempt to censor or remove a piece of information from the public domain has the unintended consequence of generating more publicity than if it had just been left online. Nestlé didn’t stop there however: inevitably as their Facebook page became the source of comments and questions about their use of Palm oil, Nestlé instead responded angrily to the use of their logo as an avatar image, again resulting in yet another deluge of tweets and status updates. The end result was Greenpeace claiming the upper hand, and Nestlé looking out of step with the campaigners and their customers. The other social media ‘fail’ of the past week has been the Conservative website launched to promote the message that Gordon Brown is supported by money for the Unite Union – currently supporting a strike by British Airways workers that has divided opinion. Interestingly the CashGordon site features an unmoderated twitter stream repeating every tweet with the #cashgordon hashtag. It’s a particularly old school concept which dates from when twitter was a relatively new phenomenon, and having anyone tweet about your site was quite exciting. 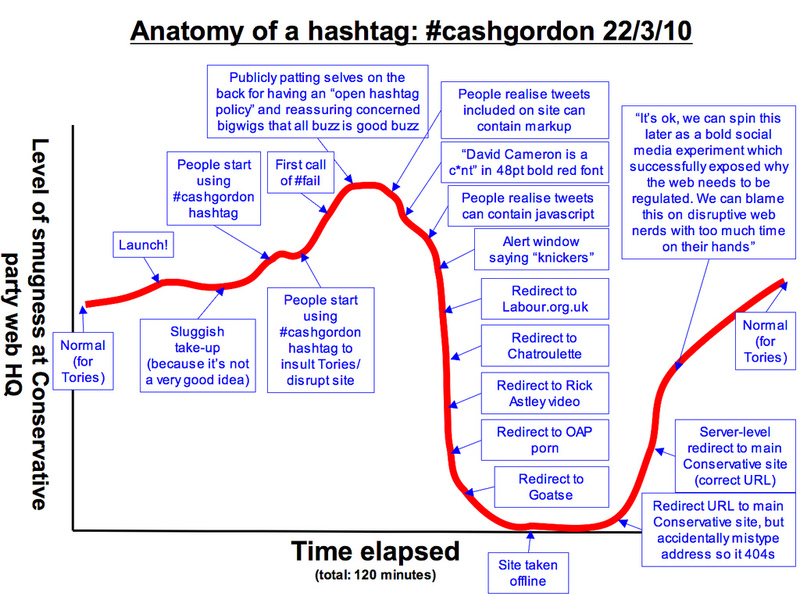 Interestingly however the very presence of the website, and the numerous comments on the #cashgordon hashtag has had the unintended consequence of bringing the whole campaign to the attention of a much wider audience (at time of writing #cashgordon is trending in the top ten of the UK) which itself is being claimed as a success.